Young Harpist plunks away to charming and dramatic effect. One of the joys of the lunchtime concerts at St Martin’s in the Fields is their habit of showcasing young talent in combinations of programme and instruments you don’t often see. I am occasionally covering these concerts to remind myself of super artists and performances , and to alert others of names to watch in the future. Kenny, like many of the young artists appearing at St Martin’s in the Fields, is talented and fearless. 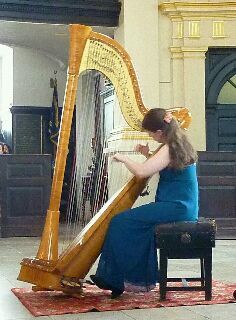 Playing mostly from memory, she covered an eclectic programme of solo harp, something I rarely get to see in chamber performances. 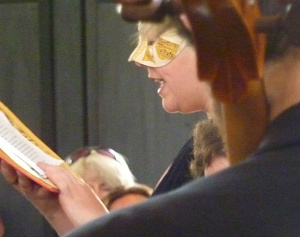 She showed exceptional skill as well as demonstrating the orchestral range and colouring possibilities of the instrument. For her finale, she was joined by the Billroth quartet, in a quintet combination that is even less frequently seen. Their choice was a macabre piece by Andre Caplet illustrating Edgar Allen Poe’s ‘The Mask of the Red Death’, preceded by a dramatic reading complete with venetian mask. The piece ends as ‘all the guests’ compulsively die in a blood dew’, causing the elderly gentleman to my left to visibly shrink back from the players as the more gory parts were read out. Dramatic readings and music describing horrific blood-spattered themes are not the usual fare at St Martins – despite this the 17 minute piece received enthusiatic applause, and a bouquet at the end. So: Melissa Kenny and the Billroth quartet; names to look for in the future.